With more than 900 cryptocurrencies out there, access to opportunities for buying, trading and investing them has not been a problem. The challenge now is how to spend them in the real world. Traditional banks hate the crypto: several days ago, South Korea banned its traditional banks from dealing in virtual currencies. The South Korean government also will ban minors and foreigners from trading in virtual currency or creating bank accounts for them in the country. At least 10 companies in Singapore which had encountered with the same problems with their banking relationships in the city state. Some organisations also experienced account closures and even 8 new crypto-friendly neobanks couldn’t help. Unfortunately, very few merchants – either online or offline – accept crypto payments directly, which may make it difficult to spend crypto for the foreseeable future. While these blockchain-backed currencies hold great promise in terms of revolutionising the existing systems, the “usability factor” of these cryptocurrencies stands in the way of their wider adoption. This is largely owing to the regulatory ambiguity and limited merchant acceptance. The fast-emerging segment of cryptocurrency-friendly cards may perhaps be one solution to this problem helping to narrow the gap between the crypto and real world, if not bridging it completely. Cryptocurrency-friendly debit cards are growing in number. 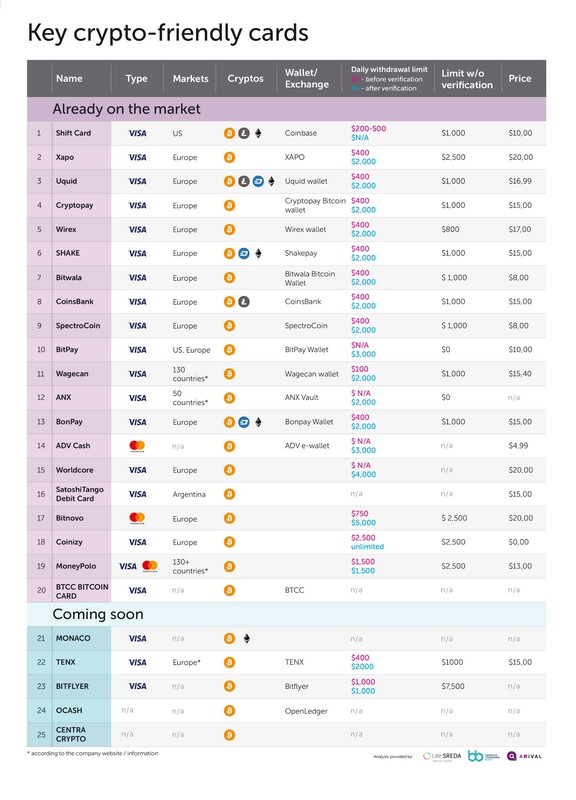 Altogether, there are 25 crypto-friendly debit cards (check our overview and report here) out on the fintech market – many of them originally from Asia. They’re trying to make crypto mainstream for regular consumers. Unsurprising, none of these cards seem to have caught on beyond a crypto-community. The primary reason is likely that there is no real advantage to using them. Whatever the difference is in the description of projects – the capabilities of the cards are 99 per cent identical. In fact, you issue a bank debit/prepaid Visa/Mastercard and give a fairly simple mobile application where you can track your transactions and make simple transfers. If compared with neobanks in fintech – functionality is at the 3-5 years old level. The only exception – they work with crypto-currencies. The key parameters of the cards are approximately the same for all of them: one-to-three currencies (USD, EUR, GBP), US$10 to US$20 for issuance of the card, US$10 to US$15 annual maintenance fee, lifetime limit is about US$1000 unless the account verified, which requires ID and proof of address, even if verified the maximum limit on withdrawing cash is about US$2000. From the point of view of working with crypto-currencies – most projects work only with bitcoins. Few also allow ether, litecoin, dash and other alt-coins. Most of them are available only for citizens of the European Union with several projects targetted at US residents. Earlier, there were less strict conditions and the cards had been issued for residents of other countries, but now Visa and Mastercard have prohibited the issuance of such cards for non-EU and non-US residents. Most of crypto-friendly cards are issued on Visa and structured in Hong Kong. All existing cards are for retail consumer use – there are no solutions for small and medium businesses. Limits on card spending are such that they are suitable for buying coffees, shopping for T-shirts and jeans, but for not for more serious purposes. Most cards are issued on the platform of the Gibraltar payment company WaveCrest Holdings, the second largest issuer is the US Metropolitan Commercial Bank. There are two new partners coming to the market – Wirecard and MatchMove. Even though crypto debit cards have been the best solution for direct crypto spending so far, nobody thinks it’s an ideal one, as there are some substantial disadvantages. The financial limits as much as possible, cryptocurrency users hate limits. Card companies are promoting that, when somebody makes a purchase with a crypto debit card, only the amount of cryptocurrency you need is sold for fiat currency, that fiat currency is then sent to the merchant in a seamless process they aren’t even aware of. Here it should be noted that often it does not work from a technical perspective. A start-up that launches such a card, makes a deposit at the partner bank where it operates, and the partner bank writes off customer transactions from this deposit (but the mutual settlement of the start-up with the client conversions for these transactions occurs later). And the deposits of these start-ups from partner banks are not so big – which suggests that the number of customers and turnover they can handle is very small. In fact – these credit cards are just fashionable additional cards in the purse for geeks and other trendy early adopters and are not a full replacement of the main bank cards. Points of sale that accept the payment of a crypto (usually more for additional PR than for a real increase in business) is also very limited. And partner banks for such start-ups are not yet ready to take on the risk of funding such transactions at their own expense. They try to work with and run on the platform of traditional banks, for which the pains and hopes of the crypto-world are not a priority. And as soon as the wind of regulation begins to change, these banks will not even try to solve the problems of the new players (they just want to make money on this risk here and now). Banks are simply transferring all the risks onto their clients – they are claiming that startups are the ones to bear all the risks and if something goes wrong, they’ll just shut these startups down, and if it works out, the startups will have to share the profit with them. The bank still does not allocate time and resources for a better understanding of how these customers work, and it does not try to change its business processes, compliance or technical back-end. The banks simply make endless “additions to the supplement” from the desire to quickly earn extra money (rather than figure out first, understand the client, his pain and needs, and then build the best service for him). A new condom is being put on top of a torn one just like all risks are being transferred to the startup. Some diseases can only be cured if recognised, and it is much healthier than trying to hide them, putting one plaster on top of the other, or eating one vitamin pill after another. The boundaries of what is allowed for these startups, in fact, confirms the situation. Banks keep them on board only as long as they do not interfere with their main business. Given the limits set for such cards, it is akin to the democracy in Russia: formally, everything is in place – the constitution, parliament, elections, and freedom of speech – but each parameter is so much adjusted to the special rules of the game, that this mimicry does more harm than good. “I am for democracy because such is my royal will.” This is the reason why I am looking for a bank in the US to buy – to be focused only on this type of startups and this type of “source of funds”, and to help all of these cards to realise their approach too.